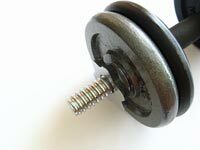 Depending on your definition of cheap, dummbbells are not… Cheap dumbbells are definitely hard to come by. When looking at a traditional set the cheapest set I could find ran for around $650 for a completely standard, non neoprene set, weights from 5 to 50 lbs in 5 lb increments, without the stand. So if you’re looking to add weights to your home gym, you are looking at a decent investment. The average cost is about $1.15 per pound. Because of this the best recommendation that I can offer for a cheap dumbbell set is an adjustable dumbbell set. The cost of a typical adjustable set is about $.60 per pound. They are still not “cheap” per se, but they are definitely less expensive than a traditional dumbell set. An adjustable set comes with 1/5 of the weight of a traditional set, but unfortunately they are little more than 1/5 of the price. This is due to the adjustable aspect. Those moving parts need to be paid for. However, you can get a nice set of adjustable weights for as much as or less than it would cost you to buy a bare bones traditional set. Not to mention, they are a wise choice for a home gym for one other important reason… they take up way less space. A traditional set will take up an entire wall in a room. An adjustable set can easily be stashed in a corner, in a closet, or some other small or out of the way place. Adjustable sets are the best alternative if you are trying to save money and have limited space. You can get a full body workout easily. However traditional sets are more durable and have their own benefits. If you are looking to buy a traditional dumbbell set, make a list of what is most important to you (amount of weight, neoprene, stand etc) so you can spend your money in the wisest way.